The Firkin pub chain was started in London in 1979 by David Bruce. He stepped in and bought a few run-down pubs off the major brewers where they were unable to make them pay. As well as redocorating the pubs in a basic but friendly style, he introduced the long forgotten concept of pubs brewing their own beer. The breweries were tiny and were located behind or underneath the pubs – often with viewing windows or hatches so that the ‘machinery’ became part of the environment. I first became aware of the chain in 1980 when friends took me to one of the original pubs, the Goose and Firkin in Borough, London SE1. The pub was packed and the atmosphere very lively, with a pianist leading everyone through an old style pub sing-song. I also used to frequent the original Frog and Firkin – a tiny pub just by the Hammersmith & City line near Westbourne Park station. Another well known pub was the Phoenix and Firkin which occupied the old ticket office at Denmark Hill station in South London. The name refers to the fact that the ticket office was previously destroyed by fire, but was renovated to create the pub. With the success of the concept, the chain grew rapidly until 1988 when David Bruce sold the chain to European Leisure. The pubs changed hands a couple more times in a short period until in 1991 the chain was taken over by Allied Lyons (later Allied Domecq). After this the chain expanded again, not just in London but all over the country – typically in university towns. There were a few wobbly periods but generally the pubs were excellent, had a great atmosphere and played good music too. The 1995 CAMRA Good Beer Guide records that the chain had 44 pubs of which 19 actually brewed. (The non-brewery pubs were supplied by one of the other Firkin pubs). Each pub tended to have it’s own named bitter, along with the Dogbolter and other seasonal beers.The Dogbolter was always my favourite drink as it tasted like nothing else – a rich, dark, strong brew, although it didn’t do to drink it all night long. When going for a night out in London, trips to Firkin pubs were always on the schedule. 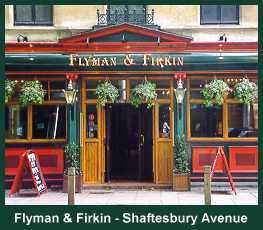 My favourites were The Flyman and Firkin, Fanfare and Firkin in the West End of London, along with The Fringe and Firkin in Shepherds Bush. I can’t remember the name but the Firkin pub in Winchester was really good too. Apparently in the spring of 1999, Whitbread and Punch Taverns both made hostile bids to take over the entire Allied Domecq pub roster. After a bidding war, Whitbread pulled out of the running leaving Punch Taverns to take over with financing from Bass. It then appears that Punch Taverns sold the Firkin chain on to Bass. Early in October 1999, signs were appearing in Firkin pubs in London announcing that Firkin beers were to be discontinued, to be replaced with two ‘new’ and ‘exciting’ brews – namely Tetleys and Burtons. So on October 8th 1999 all brewing of Firkin beers stopped completely and all the brewing staff were made redundant. Some of the Central London Firkin pubs had stock left for a few days, but because of the high turnover, it didn’t last to the following weekend. It is unclear why Punch Taverns/Bass bought the chain and then decided to cease production of the distinctive Firkin beers, but it was certainly not done in the interest of consumer choice. Tetleys, and Burtons especially may have been quality beers, but they are limp and lifeless when compared to Firkin beer. Following any of the links in this section will take you away from this site and I can’t be held responsible for their content. Some background to the Bass takeover could be found on a CAMRA Press Release, but the page has been pulled now. Link to other brewing related news stories at the CAMRA Home Page. John Paul Adams also has a site with beer related facts including a list of all the Firkin pubs within the Greater London area. David Bruce is now a director of the Capital Pub Company which operates about 25 pubs in London. These pubs are appranetly not themed in the same way the Firkin pubs were, and none of them brew their own beer. Dogbolter actually does live on! The Ramsgate Brewery, based in Broadstairs brews Gadds’ Faithful Dogbolter Porter which I believe uses the same recipe as the original Firkin versions. And I have read comments that it tastes very like the original. You can read more about it in a blog post elsewhere on this site from 2009 entitled Firkin Dogbolter. In 2000 I naively believed that pub chains would care what their customer thought since it was the customers that chose to go there and buy the beer. Looking back it was obvious that Punch wanted to minimise costs and maximise profits so weren’t really interested in the craft brewing and other unique aspects of the Firkin chain. I guess they were also interested in acquiring a chain of pubs that were often in prime locations within towns. Yes I remember the Fox Lewisham previously Flanagan’s The Black Bull not a place to linger. In the Fox when they handed out the song sheets I didn’t need ’em. Happy days of long ago. Plus I was in the Firkin South Croydon when they put on the last 9 of Dogbolter. It went in half an hour and that was it. No more Dogbolter ever or so we thought. Very sad to read of the demise of the Firkin chain. I lived on Camberwell Grove as a student in London in the eighties, the Phoenix and Firkin was my closest pub. The Firkin pubs put good quality real ale back on the map. Great to see this post. Friends and I were regulars as Firkin pubs. Notably the Frog, Goose and Phoenix. Sing-songs at the Goose were infamous, with Fats Domino’s Blueberry Hill being belted out by mostly students. David Bruce was ahead of his time. So sorry that the venture got killed by the corporates. Bass bankrolled punch taverns to go in and handle the redundancies etc. The story was that as you get taxed at a different rate depending on your brewery capacity, if Bass acquired the breweries directly it would take them over some Excise duty threshold. SO the little eager beavers Punch taverns went in with their hatchets and did all the messy firing of staff in return for some of the run down estates, they then passed the now beer production free brewpubs over to Bass. I used to work and live in the Goose and Firkin in 1985. At that time there were about 8 pubs, I think the latest one was the Flounder. (I still have a beermat somewhere!). It was mad, but good fun. I used to cut and butter the large bags that you could buy for £1 with various fillings. The most popular beer was Dogbolter (of course) then all the pubs sold the same brew but it had a different name depending which pub you were in ie the Goose in Goose and Firkin. There was also another beer called Gagglegobbler which we could only sell in half pints. There were different live acts, I remember Kjarten Poskitt who played the piano and sang, he was known from the children’s tv programme “Pob”. Also Debbie and the Bear. I remember mould growing on my shoes from the spilled beer. All good fun! What a nice page! I played the pianos in almost all the Firkins in the 1980’s, in particular Fridays at the Frog, and Saturdays at the Falcon in Hackney, then later Saturdays at the Flamingo in Kingston. Completely bonkers nights they were too. One night people jumping about in the Flamingo cracked the beams in the cellar. And new years eve 1987 in the Falcon, the piano (covered in glasses) was rocking so much it fell over backwards. Yay! Paid off my first mortgage, found myself a wife and met some brilliant characters. Good times. Thank you Kjarten! I owe you multiple pints for all the great times you gave us! I used to drink regularly in the the Phantom and Firkin in Loughborough, an excellent pub. We turned up one day to find notices on all the tables announcing that owing to ‘customer demand’ the Firkin beers were being replaced by Greene King IPA. Haven’t been in since! Hi all, I used to run the Flyer and Firkin in Reading from 1997 to 2001 and my other half Diane ran the Firefly in Bournemouth in 2000. They were mental fantastic busy busy days, you will never ever see pubs like this ever again! Way ahead of their time, giant Jenna and giant Connect 4, as big as a person, tables made for dancing on and the most insane staff and beer you would ever find! Oh happy days!! I remember visiting Goose and Firkin semi-regularly while a medical student at Kings College Hospital (had to be an outing as bit of a trek). Unfortunately Phoenix did not open until after I qualified and moved to Lewisham but would still meet up there (and wife a nurse at the hospital). And there was the Fox and Firkin in walking distance. Then in 1994 moved to Southend and there was the Fish (previously called the Alex and now the Alex again). While i have never liked Porter did appreciate the bitters. A google search for an ale, one link led to another and in 3 clicks I found this page. Remarkable to stumble across these memories so like mine! Thanks for that. Introduced to the Firkin concept at the Goose in the mid 80’s, as students we returned there faithfully on our trips to the capital. We also had a riot at the Phoenix, the Fox, the Friar in London and at the Fleece & Firkin in Bristol. Ahead of its time? Probably, and in tune with what we sought: tasty beer and raucus fun. I’ve spent a lot of time abroad. Currently in Paris where there is a Freedom & Firkin. I’m not sur if/how it is related. In around 1994 a couple of entrepreneurs opened the first brewpub to have been set up in Paris in 100 years or so: the Frog & Rosbif. They transposed the concept basically. There is now a chain of Frog pubs, a couple of which are worth a visit when you come to Paris. I regularly used to drink in the Goose and Firkin and fondly remember the ‘Gobstopper’ Winter Ale. I’ve still got my commemorative tankard with the signs of the original 12 pubs engraved on it. Dogbolter was produced for a while as a home brew kit which I brewed back in the 1990s. Whilst I never tasted the pub version I remember the homebrew kit delivered a great pint of ale, one of the best I’ve brewed from a kit and I was devastated when I was told it had been discontinued. Wish I could get hold of the recipe now! A thread from back in 2011 on the home brew forum talks about the kit. There’s also a what they say is public domain recipe for Dogbolter, but it’s a full grain recipe so not for the average home brewer. Me and my husband started our training in the Phoenix and firkin in 1988 we then went on to manage the pheasant and firkin just off clerkenwell. Brilliant fun. Hi Adrian Hall! You wrote, “Hi all, I used to run the Flyer and Firkin in Reading from 1997 to 2001 and my other half Diane ran the Firefly in Bournemouth in 2000.” My wife and I visited from New York and visited the Firefly in Bournemouth where I bought their t-shirt and Diane autographed it for me! Still have it – thought it was too cool to wear! Raina Sharples, were you still there when Stakis Leisure took over? Did you train with Scottish couple at the Phoenix? I was the area manager sent down from Scotland to look after the original Firkin chain. Back in the early 80’s, did a pub crawl after playing football in Lewisham and slowly progressed back north of the Thames only to stop at the Goose & Firkin en-route! I was introduced to Dogbolter and quaffed it with aplomb and after a second pint, claimed that it wasn’t very strong but ended up sliding down the bar hence I was nicknamed after the beer! Good days and great pubs…….time for second wave!? ? I will! And postage to Australia ? John Robertson, yes we were at the pheasant and firkin when stakis leisure took over. Mark and I were managers there. We did do out training at the Phoenix but not with a Scottish couple, it was Dot and Steve that trained us, also Dave and Kay were also trained the same time as us, they went on to manage the falcon and firkin. Sorry don’t recognise you name. I used to have an engineering company who built breweries for the firkin chain and also built the frog pubs in paris. I did my apprenticship at the company who made the goose and firkin and fox and firkin breweries. Among those we made and fitted out were the ones in Bournemouth(hard work that one it was upstairs), Manchester, Southend on Sea (which is where we the business was situated) Luton, Sutton modified and refitted the Falcon at Hackney, Coventry and a few others. Raina, I came down from Scotland to replace Gerry Walsingham as Area Manager. George McLaren was my boss. At my age the memory isn’t what it was but I do know that Gordon & Sue Simpson (now in New Zealand) were managing the Falcon on the edge of Victoria Park because we’re still friends. Can’t be sure about the couple I met at the Pheasant but I’m sure his name was Paul. I returned to London in 2000 to work for Punch Taverns and had both the Pheasant and the Falcon on my patch but the Firkin ethos had long gone by then. Corporate attempts to replicate the Firkin brand, across their estates, failed miserably but I was proud to be part of something unique in the licensed trade. I too had some time working at the Firkins, mainly in London, but also Manchester, Derby, Norwich and Kings Lynn (non Firkin) to name a few. Miss a lot of the people, but glad to see some of the brewers are still working in the industry, Eddie Gadd, Steve Lawson, Eddie Baines, Steve Mann and not forgetting Nick (the hat) Milo, glad to have worked with these and others. Also John Robertson, George McLaren, and of course Gordon and Sue. Pre Notting Hill Carnival August 1984 ended up in a pub called the Frog and Firkin on the Saturday evening what a wild wild night, pianist was brilliant beer was amazing and the atmosphere electric. Jumping, laughing and dancing until the the bar reluctantly closed. Nearly 34 years ago and I still remember the night as if it was yesterday!? That would have been me on the piano when Colin and Gunilla were running the pub. The Bank Holiday Monday’s Carnivals were always surreal. There used to be 3 police on the roof with binoculars and radios watching the crowds while (by way of thanks) a 4th bobby ran a barbeque for the pub staff. Amazing times! Just fortunate that none of us actually fell off. John I remember jerry walsingham he was our area manager he could be really nice at times! Good times it was another family. I had just left school in 1984 and my engineer took me to these pubs in London loved dogbolter. I then went around about 7 of them to collect the tee shirts from them ( which i still have some) as well as having a drink. These were used for our 5-a-side football kit for our team and we called ourselves “The Dogbolters”. Mike M. Me and my husband designed the t shirt for a pub crawl in 1989/90, you had to do all 11 pubs in one day drinking a pint of dogbolter in each and getting your card stamped in each pub. We used to get called to warn us of what state to expect the bus load. I will see if I still have that t shirt. Incredibly happy memories of the Ferret & Firkin on Lotts Road, Chelsea in the early 90’s. Friday nights were great with the piano. Those were the days, piano man, Patricia the stripper and other great songs all washed down with a few pints of Dog Bolter. We went in there after England lost to Australia in the rugby Worl Cup final in oct 1991 and the place was absolutely jumping – as if we had won it. Great days! As a visiting student in 83/84 from the States to Queen Elizabeth College (Camden Hill Rd, Kensington High), I fondly and groggily remember many treks to the Frog in Notting Hill for a couple of pints of Dogbolter. I still have the Firkin coasters next to my dart board. My daughter is in London this weekend and thus the search for Frog and Firkin where I had a story similar to so many of you. I remember a tee shirt that said something to the effect of froggods sake buy me a firkin pint. I so wish I had it still. What a fun memory from more than 30 years ago. There was a small fire to do with the brewing, and we all temporarily wandered out into the street enjoying our pints until we could resume inside. How has time passed so quickly for us all?! Delicious beer. I was living in London in 1987 and just found my 31 year old Ferret & Firkin t-shirt. A bit tattered, but wearable. Will see if this summer, living in a touristy area (Cape Cod, Massachusetts), if anyone comments on it/recognizes it. Great memories of quaffing Dogbolter and Earthstopper (beware!) at Goose & Firkin in the 80s. Also remember Fox & Firkin, Ferret & Firkin among others – vaguely recall that we used to try and visit them in London at least, but after several pints its difficult to be specific. Such a shame they got swallowed up into corporate greed. I’m a Yank that studied at the Univ. of Edinburgh in he first half of 1997. Physician & Firkin was my place. Spent waaay too much time there. Luckily it was in walking (stumbling) distance of my flat. I remember a group of us trying to explain American Football to everyone during the Super Bowl between the Green Bay Packers and New England Patriots. The Dogbolter didn’t help the explanations! It seems that I got to enjoy some Firkin good times right before the company went the way of the dodo. Thank you for the good times, and the good stories that you all have shared! Wow! We used to go to the flounder in Holloway Rd. Loved the crowd, the craic and the piano in those pubs. l found myself working there when the chain went from Bruces brewery to Firkins. l was telling my friend about this really great pub. Went inside, the place was like a regular pub around there, no atmosphere at all. I really miss Dogbolter. I remember the Goose & Firkin from the early 80’s and actually dancing with Leigham Vale Morris inside the bar one Sunday lunchtime. Excellent fun. Dogbolter was also available for homebrewing. Unfortunately my attempts at this were nowhere near the real thing. Used to travel down to London and try and visit Firkins when in town. Had my stag night as tour round about 6 of them before the Dogbolter took hold and we stayed put in the last one. Flounder was a favorite, particularly one time they had Ginger beer on draft, great taste and a stinging afterburn on your lips. The barman warned me not too have too many, he pointed to a guy sat on bar stool but passed out. Hes had at least 6 I was informed. Later said guy woke up and and was helped out , it was Shane McGowan of the Pogues! Riana. Remember Jerry too, he left and went off on a yacht trip round the world. Shame they shut the old frog and moved it! Do you remember Steve Mann? Does anyone know what happened to Frankie Flame? He was a legend. Had some great nights at the Goose and Firkin. We used to travel across for W London, and walk from Waterloo to get to the Goose. They still had sawdust on the floor in the good old days, with the place packed and Dogbolter flowing … good times. The end of an era sadly. But what happened to Frankie Flame? Has anyone put anything on YouTube?? Blimey! Didn’t realise there was so many memories! I graduated from the Goose to the Pheasant in Goswell Road. Sid the manager and Chris and Tony on piano. David Bruce very much alive and kicking as Chairman of West Berkshire Brewery (Newbury) and occasionally brews the odd limited run of Dogbolter for old times’ sake. Worth a pilgrimage to the new brewery in Yattendon and a trip down memory lane. Best wishes to all, Rupert.